TV show dates: February 26, 2018 — July 21, 2018. Performers include: Jay R. Ferguson, Lindsey Kraft, Ian Gomez, David Krumholtz, Tony Rock, and Camryn Manheim. From creator Patrick Walsh, the Living Biblically TV show is inspired by the AJ Jacobs book, The Year of Living Biblically. The sitcom centers on Chip Curry (Ferguson), a film critic for an NYC newspaper. After the death of his best friend, Chip decides to live a better life, through strict adherence to biblical precepts. Chip has always had obsessive tendencies. Luckily his pregnant wife, Leslie (Kraft) is a smart cookie. Although she’s highly skeptical, she finds Chip’s newest passion amusing and gives him her full support. Realizing he’ll need some guidance along his new path, Chip enlists the help of a Catholic priest, Father Gene (Gomez), and the Father’s best friend, Rabbi Gil Abelman (Krumholtz). As his “God Squad,” they listen to him, offer advice, and generally help Chip render a contemporary course of action from the Bible’s ancient instructions. At the paper, Chip’s boss, Ms. Meadows (Manheim), is surprisingly supportive of his new project — largely because she knows the story he ultimately writes about it will sell. Similarly, his co-worker and friend, Vince (Rock) is happy to give him a reality check when necessary. Like Leslie, Vince finds the entire enterprise entertaining. First aired: July 21, 2018. What do you think? Do you like the Living Biblically TV series? Should this CBS TV show have been cancelled or renewed for a second season? 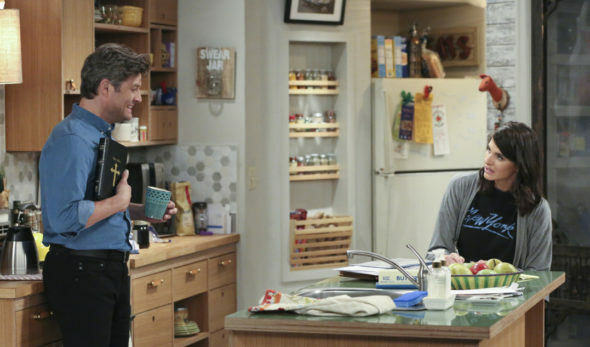 Living Biblically: Cancelled or Renewed for Season Two on CBS? Living Biblically, 9JKL, Me Myself & I: Which Cancelled CBS Sitcom Would You Save? My wife and I really enjoyed the show, the fun, clean humor and struggles with our baser tendencies in a humorous way. It was a show that we could have our daughter watch with us, which is becoming all too rare these days. I thought that show was very refreshing.. Of course it was cancelled- it was clean and actually had some substance.